Open 10am – 8pm, daily except Tuesday. 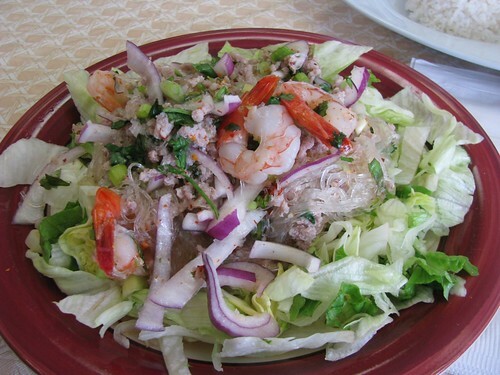 Thai restaurants have been found in and around Columbus for quite some time, but… ummm, how should we put this… unadulterated Thai has been thin on the ground with Bangkok as the only game in town. But with the recent opening of Erawan, and now Westgate Thai, the full flavors of Thailand are steadily working their way into the city’s consciousness. Westgate Thai operates out of the Westgate Import Market, and occupies the kitchen and dining area that previously hosted the lovably improbable ‘Lindo Mexican/Cambodian restaurant’ (the signage for Lindo is still up, if you find it you’ve found Westgate). Accommodations are basic, with perhaps 16 seats in total, but service is consistently kind and thorough. The entirety of the staff consists of a husband and wife duo, with the wife in the kitchen and the husband manning the front of house. Given the small size of the operation, this has been more than adequate, and wait times have been entirely acceptable. The food’s been great. 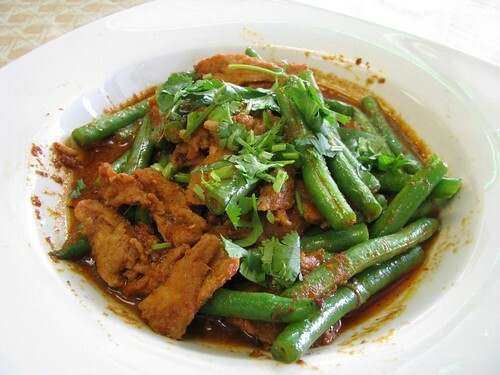 From the yum woon sen to the pad phrik khing to the nice selection of curries, we haven’t found a bad pick in the bunch… and we’ve probably eaten more than half of the menu. They’ll adjust for your taste in spicy heat, which is to say that if you like it truly hot they’ll be happy to take that as a challenge. If, among the fairly wide selection available, you’re looking for a place to start, I’d recommend the khao kaphrao khai dao (my preference is with pork) – a potent shot of Thai basil mingling with garlicky porky goodness, served with an egg that’s been fried until crispy around the edges (but still maintains a runny yolk) and rice. Try it as the Thais tend to do, by constructing bites with pork, egg, and rice all on one spoonful (yes, Thais mostly use a fork and spoon at the table). Prices are notably wallet-friendly – apps start at $.50, and entrees are generally between $5.99 and $6.99. Entrees are discounted by $1.00 for lunch business. We had a group of 5 eat to contentment and beyond, and walked out with leftovers on a $32.00 bill. A few vegetarian and pescetarian options are available. 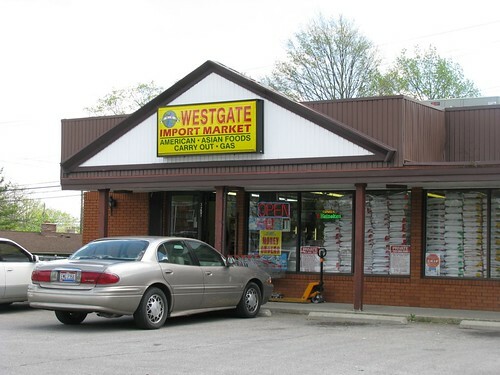 We’d be remiss in neglecting to mention that Westgate Import Market itself is a worthwhile destination. Southeast Asian staples and curiosities make for great browsing (we rarely leave without buying something), and the family that runs it is friendly and welcoming in the extreme. They offer a variety of prepared foods near the checkout – we’ve particularly enjoyed the mildly sweet sticky rice desserts packed in lengths of bamboo.